Вашему вниманию представляется статья из американского радиолюбительского журнала QST за июнь 2000 года где авторы конструкции Howard KH6TY и Dave NN1G опубликовали разработанный ими QRP микротрансивер специально для работы новым видом связи PSK31 в диапазоне 20м. Трансивер представляет собой небольшую коробочку, без привычных органов управления, подключаемую к компьютеру (к звуковой карте и СОМ_порту) и КВ антенне на 20м диапазон. Он обеспечивает панорамный прием полосой 4 Кгц в psk участке (14.070 МГц) диапазона 20м, и передачу в указанном участке с мощностью около 5 вт. Схемотехника выполнена на современной элементной базе с применением микросхем. В статье приводится схема, конструкция и описание аппарата для повторения опытными квалифицированными радиолюбителями. Трансивер рассчитан на работу с известной psk программой DigiPan, одним из авторов которой так же является Howard KH6TY. Хотя, нет ни каких препятствий к совместному использованию трансивера с любыми другими psk программами. В настоящее время авторами налажен серийный выпуск этого аппарата и довольно часто в эфире можно встретить зарубежных (и не только, например UU9JDR тоже работает psk на этом аппарате) радиолюбителей работающих psk именно этим трансивером. К сожалению, у меня нет ни свободного времени, ни особого желания переводить статью на русский язык, на мой вкус читается без проблем на языке оригинала; так что насчет русификации мое sorry. Кстати, данная конструкция при определенном творческом подходе довольно легко превращается в обычный кв трансивер c хорошими характеристиками, работающий ssb, и cw в том числе. Такой опыт у знакомых мне радиолюбителей уже имеется. Combine an inexpensive transceiver, some free software and you're on PSK31 at a rock-bottom price! Add to that the fun and pride of building the transceiver and you've got a n irresistible package! I is a relatively new I digital mode, created Iby Peter Martinez, | G3PLX, and covered in detail in QEX.1 Because of its narrow bandwidth requirements and the Viterbi decoding built into the mode by Peter, PSK31 is ideally suited to Amateur Radio digital communications using low power. However, the narrow bandwidth of the PSK31 signal—31.25 Hz—makes tuning PSK31 signals somewhat more difficult than tuning SSB and CW signals, because accurate tuning to within only a few hertz is necessary for proper decoding. This requirement has resulted in several attempts to make tuning easier, such as the PSK31 tuning aid described by Don Urbytes, W8GLV,2 and the phase scope and waterfall display Peter included in his popular introductory software for PSK31. It was during an e-mail exchange with Peter that I hit on the idea of eliminating the need for tuning altogether! The concept of the Panoramic Transceiving System for PSK31 was born. As Steve Ford, WB8IMY, put it so well in his article, "PSK31—Has RTTY's Replacement Arrived? ",3 PSK31 signals don't deedle-deedle like RTTY signals, or chirp like the TOR modes, they warble, sounding like high-pitched, warbling carriers as you tune across them. If several PSK31 stations are operating close together, they sound like a bunch of caterwauling alley cats! It is virtually impossible to separate the individual stations by ear, as the human hearing cannot distinguish between different tones very close together in pitch, so some other technique must be used to separate stations and the best way to do it is visually*. Figure 1—A sample of DigiPan's PSK31 signal display. At the bottom half of the screen, the bar with the diamond-shaped cursor in it (the large bar at the left) is a strong PSK31 station. (Incoming signals scroll from top to bottom; the newest signals are at the top of the display.) The ongoing chatter—complete with typos—is readable in the top half of the screen above the waterfall display. DigiPan employs digital signal processing (DSP) techniques to decode the PSK31 warbles and present them as characters on a computer display. A portion of a typical DigiPan spectrum window is shown in Figure 1. The bright yellow bars represent the signals within the passband. The left-most signal with the diamond-shaped cursor in it is a strong PSK31 station to which the receiver is tuned. Time is displayed on the Y axis, progressing from top (most recent) to bottom (past). To tune in and receive any of these stations, all you have to do is use the computer's mouse to point to the station's signal and click! The diamond-shaped cursor jumps immediately to the center of the station signal and the chosen station's transmitted information appears on screen in a receive window. Other sections of the DigiPan screen are devoted to buttons to control the functions of DigiPan, the receive window and a window for typing outgoing text, you can download a copy of Digifan free on the web at http://members.home.com/hteller/ digipan/. For DigiPan to provide a panoramic display with point-and-click tuning of stations, it is necessary for the transceiver to provide panoramic reception and transmission, which means the transceiver must be a special wideband design, capable of receiving many PSK31 stations at one time. Therefore, the second important element of the Panoramic Transceiving System is the transceiver itself. There are characteristics of PSK31 communication that dictate (and to some extent simplify) the transceiver design. The narrow width of a PSK31 signal demands a very low-drift design, typically less than 5 Hz over the course of a QSO. However, the narrow signal width also means lots of stations fit into a very narrow slice of spectrum! The fortunate result is that it is possible to make a simple, low-drift, crystal-controlled receiver and transmitter and let the software perform the tasks of displaying the signals on the band and tuning them in. The TR switching requirements prove to be quite simple. Unlike CW, there is no need for perfectly shaped keying or fast break-in, and the transmit/receive function need be no more complicated than throwing a switch. To ensure the most reliable TR switching, we elected to use a standard RS-232 signal (RTS or DTR) available at the computer's serial port to control the TR changeover. To properly transmit and receive a PSK31 signal, it is necessary that the transmitter and receiver be operated linearly. Although it is still possible to overdrive the transmitter or otherwise operate in a nonlinear range and have the signal decoded successfully at the receiving end, you won't win any friends on nearby frequencies! The spectrum of an overdriven transmitter signal extends well beyond the normal narrowband signature. With the panoramic display, your signal spectrum is displayed for all to see, and you're sure to get meaningful feedback from the stations you're in QSO with or who are on nearby frequencies! Dave: When Howard contacted me regarding the use of an existing linear SSB design for a PSK31 transceiver,51 was naturally curious as to the modifications necessary to yield reliable operation. Those amounted to extensive changes to improve the LO stability, as discussed later, and a new TR switching mechanism. Howard had developed a small outrigger board that contained the necessary PSK31 circuit functions, but the additional modifications to the existing board didn't lend themselves readily to ease of reproduction. To eliminate the need for the hand wiring and modifying an existing SSB transceiver, I agreed to incorporate the changes into a clean new layout. The result of this collaboration is shown in the schematic of Figure 2. The following discussion highlights the changes with respect to that earlier design. TR switching is controlled by an RS-232-level signal (RTS)6 directly from the computer. Comparator USA responds to a positive voltage input by turning on the transmitter bias supply (Vsw) through USB. The components between those two comparator sections provide a time delay necessary for TR sequencing. Catch diode D7 ensures rapid turnoff of Vsw when switching back to receive—this suppresses an otherwise-sizable transient at the transmission tail end. Audio drive to the transmitter is provided by the computer sound-card's LINE OUT jack to J2. Q4 provides an effective means of muting this input during receive (more on this later). When Q4 is turned off, the following amplifier stage also has no bias and is quite effectively turned off as well. Q6 is an emitter-follower providing a nominal 50-ii source impedance to U6. This doubly balanced diode-ring mixer normally passes little of the LO signal generated by the 9-MHz oscillator (Q7 and associated components). On transmit, audio modulation applied via Q4-Q6 unbalances the mixer's operation, forming a 9-MHz DSB signal at U6 pin 1. The IF filter (Y7-Y10 and associated components) passes only the lower sideband to yield a 9-MHz SSB signal. U7, a doubly balanced active mixer, converts the 9-MHz SSB signal to 14 MHz. The second LO (Q8 and associated components) runs at approximately 5.073 MHz. Note that both of the LOs use Figure 2 (previous page)—Schematic of the PSK31 transceiver circuit. Unless otherwise specified, resistors are 1/4-W, 5%-tolerance carbon-composition or metal-film units. All small-value capacitors are NPO/COG types; do not substitute. Unless otherwise noted, equivalent parts can be substituted; n.c. indicates no connection. Parts identified by NJ are available from the New Jersey QRP Club. Send an SASE to George Heron, N2APB, 2419 Feather Mae Ct, Forest Hill, MD for a price list. Proceeds benefit that club's activities. Other parts are available from Digi-Key Corp, 701 Brooks Ave S, Thief River Falls, MN 56701-0677; tel 800-344-4539, 218-681-6674, fax 218-681-3380; http://www.digikey.com and Mouser Electronics, 958 N Main St, Mansfield, TX 76063-4827; tel 800-346-6873, 817-483-4422, fax 817-483-0931; sales@mouser.com; http://www.mouser.com. Misc: 1C sockets, TO-220 heat sink, inductor-tuning wand (Digi-Key TK9003), hardware, enclosure, PC board (see Note 6). L-network matching to the mixers; this eliminates having to deal with those annoying multifilar toroid windings! Emitter-follower stage Q9 buffers the high output impedance of U9; its output feeds amplifier U8, an MMIC selected for its small footprint and good stability. L8, L9 and associated components form a 14-MHz band-pass filter that eliminates unwanted images and spurs. The following two amplifiers (Q10 and Qll) are virtual cut-and-pastes of my earlier work except that matching between those two stages is done with another L network (L10, C38) that eliminates another multiple-winding toroid. L10 and all succeeding inductors need to be self-shielded types (such as toroids). D13, D14 and associated components serve as a convenient test point for tune-up purposes. If desired, an LED may be connected to TP2 to function as an RF-output indicator. The output of this circuit is a dc signal, so the LED may be remotely located on an enclosure's front panel. This reduces the risk of RF feedback/coupling problems caused by the proximity of wiring harnesses to circuit components. When the transmitter is properly adjusted, the LED flickers noticeably, and with a little practice, serves as a rough guide to setting up the sound card output level. 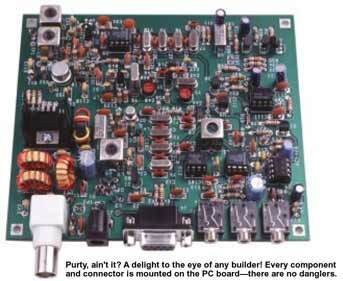 The receiver retains the low-gain preamplifier and diode-ring mixer of my April 1997 QST design (see Note 5). Although high in component count, it maintains the relatively high immunity from overloading (IMD) of that earlier work. The matching between the first mixer post-amp and receive crystal filter was changed to an L-network configuration to accommodate the high crystal-filter impedance. Because the host computer provides either a speaker-drive capability or an AF output intended for use with amplified speakers, there's no need for the receiver to provide significant audio-output power. Audio amplifier stage U4A uses a garden-variety op amp to provide the necessary gain. The remaining half (U4B) of that dual device is pressed into service as a follower for a peak detector (D5, D6 and associated components). That circuit delivers AGC to prevent strong signals from overloading the product detector (U3) or the computer's sound-card channel. Because PSK31 reception and transmission requires a highly stable frequency control, we established a goal for drift performance of less than 5 Hz over the course of a QSO (roughly 10 minutes). Ordinary VFOs weren't considered because they aren't stable enough, and PLL and DDS designs were deemed too expensive and complicated. Even commonly used VXO circuits produce too much drift. Finally, I found a combination of low-cost computer crystals that made it possible to use a simple crystal oscillator with minimum pulling and, therefore, with very low drift. A 9-MHz Cohn filter is used for the IF and a 5.0688-MHz computer crystal employed in the first-conversion oscillator. By adding a small value of capacitance in series with the crystal, it was made to oscillate at 5.0695 MHz, above its marked frequency. To bring the IF-filter and the conversion-oscillator frequencies closer to those desired and to reduce the need for pulling the first-conversion-oscillator crystal, I selected series-resonant crystals for the filter, but use a parallel-resonant crystal for the first-conversion oscillator. In order to achieve panoramic operation, the crystal filter in the IF needs to be almost 4000 Hz wide. That is accomplished by using small values of capacitance and high termination impedances for the filters. The resulting filters have a center frequency of 9.0015 MHz, with -6-dB bandwidth points around 8999.5 MHz and 9003.5 MHz. This choice of crystal characteristics makes it possible to use off-the-shelf crystals to yield a transceiver design with a zero-beat frequency of 14.073 MHz located at the high end of the PSK31 activity. This bit of serendipity made the design of a dedicated PSK31 rig irresistible! The filters exhibit asymmetrical skirt characteristics, so the BFO injection oscillator is set to the high side of the filter passband to take advantage of the superior roll-off characteristics there. This resuits in improved rejection of opposite sideband energy. This also results in LSB operation, nonstandard on 20 meters. This proves to be no handicap, however, because the DigiPan software simply compensates by displaying the panoramic spectrum in consistent left-to-right fashion regardless of whether upper or lower sideband is specified. A signal arriving at 14.072 MHz, for instance, results in a beat note or tone, of 1000 Hz. Similarly, an incoming signal at 14.071 MHz produces a tone of 2000 Hz. The receiver frequency remains fixed at a zero beat frequency of 14.073 MHz, and tuning in any particular signal is only a matter of instructing DigiPan to decode the signal at a particular tone frequency by pointing to it with the mouse and clicking. It is not practical to disable the sound-card microphone input during transmit through software control. Because the sound card has high gain from the microphone input to card output, it's also necessary to disable the receiver output during transmit. Without this provision, the receiver output would wrap back into the sound-card input, and appear along with the transmit audio in the sound-card output, causing unwanted modulation distortion or even oscillation. Q12 provides an effective low-resistance path to ground that shuts off the receiver audio output during transmit to prevent this problem. Similarly, the sound card's LINE OUT signal is present at all times. Unless effectively muted before it gets to the continuously functioning first transmit mixer, U6, that mixer will generate 9-MHz DSB signals. These are, in turn, audible in the receiver because of its high sensitivity, with the same potential for unwanted oscillation. The two-stage muting circuit (Q4, Q5) described earlier provides the needed muting function. Kits are available to ensure quick and easy assembly.7'8 If you decide to build this transceiver from scratch, "ugly" or ground-plane construction is the most convenient (if not aesthetically pleasing) way to go. The resulting performance with this construction method is good, because the plentiful ground-plane surface largely ensures freedom from ground-path problems. Keep all component lead lengths to a minimum. I find it useful to add additional bypass capacitors on long wire runs for dc and audio signals—they help keep unwanted-signal pickup to a minimum. 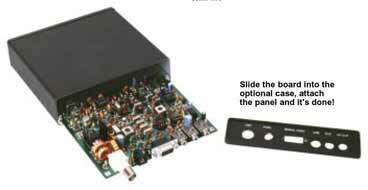 The added capacitors can also serve as convenient standoffs for other components. Where a bypass capacitor would disturb the circuit function when used as a support, a high-value resistor (1 MS2 or more) or low-value capacitor (5 pF) can often serve the same function. Scratch builders should purchase a few more 9-MHz filter crystals (about 50% more) than specified and group them within a 200-Hz spread using a test oscillator and frequency counter or general-coverage receiver. Where NPO (COG) capacitors are called for, don't substitute a lesser type! The latter are typically high-density types and are notably lossy at RF. The performance difference between the two capacitor types in critical areas (such as the transmit band-pass filter) is appreciable: I've seen an incurred loss as great as 4 to 5 dB. Such attention to detail can make or break a construction project. The tuned circuits used in this project use shielded (can-style) variable inductors. For experienced builders, part substitutions should pose no difficulty. Retain the component values shown in the schematic as much as possible, since dramatic departures will affect performance. Alignment is quite straightforward. Attach a 50-D dummy load to the rig's antenna jack (J6). Connect a 12 to 14 V dc supply to the transceiver at J5 and interconnect the computer's sound-card microphone jack to the rig's AF OUT jack (Jl). Run the installed DigiPan software to bring up the panoramic display. Some adjustment of the microphone gain setting on the sound-card mixer recording control window may be needed as explained in DigiPan's on-line Help. The correct microphone gain setting yields a speckled blue background across much of the panoramic display. Plug a speaker into the AUXILIARY LINE jack (J3), adjust L3 and Tl for maximum volume, and then readjust the microphone gain setting as needed. Set trimmer capacitor C44 so that the background noise on the display is centered within the 4-kHz panoramic passband. Set the sound-card output level to half-scale (click the speaker icon in the Windows taskbar tray). Now click on the DigiPan TX menu button. Measure the dc voltage at test point TP1, adjusting L8 for maximum reading. Move the voltmeter to test point TP2, adjust L9 for a maximum meter reading, and then readjust L8 for maximum. The easiest way to perform this one-time procedure is to calibrate the transceiver frequency against a known amateur signal. Set the DigiPan View Frequency Display selection to LSB and the Configure Start Frequency to 14073000. Transmit a CW signal on 14071000 Hz and adjust C48 until the CW signal's signature (a single bright line on the display) is directly under the 14071 tick mark on the panoramic display. Click on the DigiPan TX menu button and adjust the speaker VOLUME slider on the Windows taskbar tray for an output-power reading of 1.5 W. As you type and transmit text, the meter will flicker to higher power readings and should peak at approximately 3 W at the tail end of the transmission. Although slow compared to other picture-transmission techniques such as SSTV, it is possible to send small color pictures during the course of a PSK31 QSO. Perhaps the operator on the other end would want to get a better idea of what you look like. Because PSK31 is such a robust mode, you can send a postage-stamp color photograph of yourself or an electronic 16-color QSL card about four times larger than a postage stamp in about eight minutes. The process involves encoding the picture as text, transmitting the text, and then decoding the text into a picture at the receiving end. Apublic domain utility, BINHEX.EXE, which can be downloaded from the Internet at http://members.home.com/hteller/binhex .exe, can used for encoding and decoding. The DigiPan help file contains full details about sending pictures by PSK31. Skip: Peter's excellent work in making PSK31 an ideal QRP digital communication mode has really proven itself. My very first PSK31 QSO, using an output power of only 1 W and an inverted-V antenna in the attic, was with Valery, UT4UO in Kiev, followed by many contacts with Scandinavian, German, Italian, Australian, North African and South American stations. I regularly work stateside stations every day using only 1 W and my simple dipole antennas, with typical signal reports ranging from 559 to 579. My signal isn't as strong as many others, but in the absence of QRM or extreme fading, copy is almost always solid! I never sign as a QRP station. If I don't mention the transmitter power output, everyone seems to think mine is a typical 50-W PEP station, only my signal's a little weaker than expected. When I disclose the fact that I'm running only 1 W, everybody stands amazed! The most significant thing I have learned from this little experience is that PSK31 produces almost perfect copy—even down to the noise level. That's what amazes others and me the most. I was also pleasantly surprised one day (after I had sent Dave a PSK31-specific modification of his own SSB QRP transceiver) when Dave heard me sign with another station and called me using the same rig I had just sent him! For the first time, I was in QSO with another QRP station also running only 1 W! With the wideband IF needed for the convenience of panoramic operation, unwanted signals can get through the IF filter along with the desired ones. Occasionally, a very strong signal can either desense the receiver and affect weak-signal reception, or overload the receiver or the sound card. AGC can reduce such overloading, but is subject to pumping, particularly by strong nearby PacTOR stations. The ultimate solution to the unwanted strong-station problem during panoramic reception is to attenuate the signal before the AGC point by switching in a narrow, tunable band-pass filter at the reception frequency, or a tunable notch filter at the frequency of the strong interfering station. Both such solutions are beyond the scope of this project, but remain considerations for the future. Fortunately, the enormous convenience of panoramic display and point-and-click tuning far outweighs the occasional problems caused by very strong unwanted signals. Our thanks to Peter Martinez, G3PLX, for his invaluable contribution of PSK31 to the Amateur Radio community, and to Nick Feedosev, UT2UZ, who generously gave hundreds of hours of his time coding the DigiPan freeware to support the panoramic transceiver. Nick has also developed a greatly enhanced shareware version of DigiPan called MIXW32 V2.0 which has advanced logging and contesting features, a beam-heading indicator, an active world map, CW keyboarding and decoding, RTTY, SSB, and a unique feature called Speedscan, which makes MIXW32 the fastest PSK31 and RTTY contesting program in the world! MIXW32 can be downloaded at http://users.nais.com/~jaffejim/mixwpage.htm. Thanks also to the author of Spectrogram, Richard Home, (http://www.mnsinc.com/rshorne/gram.html) for providing an inspirational program for the DigiPan spectral display, and to Nick's assistant, Denis Nechitailov, UU9JDR, for his help in coding the programmable buttons and several other important user-friendly features of DigiPan. DigiPan certainly represents the combined best efforts of hams from all over the world! 1Peter Martinez, G3PLX, "PSK31: A New Radio-Teletype Mode," QEX, July/August 1999, pp 3-9 (reprinted from RadCom, Dec 1998 and Jan 1999 issues). 2Don Urbytes, W8LGV, "A PSK31 Tuning Aid," QST, Dec 1999, pp 35-37. 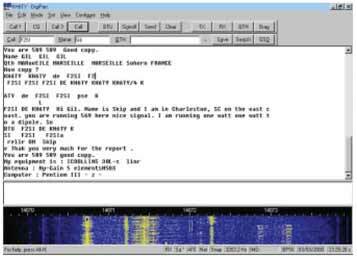 3Steve Ford, WB8IMY, "PSK31—Has RTTY's Replacement Arrived? ", QS7", May 1999, pp 41-44. 4Steve Ford, WB8IMY, "PSK31 2000," QST, May 2000, p 42. 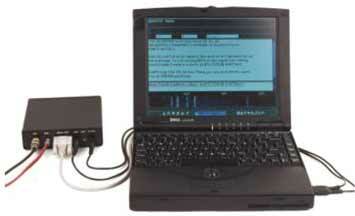 5Dave Benson, NN1G, "A Single-Board QRP SSB Transceiver for 20 or 75 Meters," QST, Apr 1997, pp 29-33. 6DigiPan Version 1.1 also allows use of the RS-232 DTR for users with pre-existing hardware interconnects. 7A kit for this project includes a double-sided PC board, all on-board components, all connectors and an assembly manual. Price: $95 in the US and Canada, $100 elsewhere, (including shipping). A black-anodized extrusion enclosure with a custom-punched and silk-screened rear panel is also available for $30 in the US and Canada, $35 elsewhere. Make checks and money orders payable to: Small Wonder Labs, 80 E Robbins Ave, Newington, CT 06111. Specialty parts (denoted by NJ in the Figure 2 caption) are available from the NJ QRP Club. Send an SASE to George Heron, N2APB, 2419 Feather Mae Ct, Forest Hill, MD for a price list. Proceeds benefit that club's activities. Dave Benson, NN1G, has published a number of articles in QST. Well known in the QRP community, he was inducted into the QRP Hall of Fame in 1999. Dave earned his BS in electrical engineering the University of Connecticut in 1976. Following graduation, he worked in a variety of aerospace engineering programs. Dave has been happily self-employed since 1996. An enthusiastic (if out-of-shape) outdoorsman, he enjoys camping and can occasionally be found on the air operating by flashlight from a tent site. In addition to other interests, Dave spends a week in Appalachia each summer as a team leader on volunteer home-repair projects. You can contact Dave at 80 E Robbins Ave, Newington CT06111; nnlg@earthlink.net. Howard ("Skip") Teller, KH6TY, was first licensed in 1954, received his commercial First Class Radiotelephone license in 1959 and worked his way through college as chief engineer of several radio stations. He holds a BS degree in electrical engineering from the University of South Carolina and is retired from running a factory in Taiwan where he manufactured the weather alert radio that he originated in 1974 and is still sold by RadioShack. Skip enjoys working PSK31 with his homebrew one-watt transceiver and developing simpler ways to buildHF equipment. You can contact Skip at 335 Plantation View Ln, Mt Pleasant, SC, 29464; hteller@home.com.